A good time to start recognizing the onset of Severe Alzheimer's Disease or Dementia Symptoms is today's date . . . Alzheimer’s disease is an irreversible, progressive brain disease which slowly destroys memory and thinking abilities and eventually the ability to carry-out even simple tasks. In most people with Alzheimer’s, symptoms first appears age-60 and above. Alzheimer’s disease is the most common cause of dementia among older people. Dementia is the loss of cognitive functioning—thinking, remembering, and reasoning—to such an extent that it interferes with a person’s daily life and activities. Estimates vary, but experts suggest that as many as 6-million Americans likely have Alzheimer’s Disease. There are 3 major areas in the brain associated with the disease processes of AD. Amyloid plaques, which are made up of fragments of a protein called beta-amyloid peptide mixed with a collection of additional proteins, remnants of neurons, and bits and pieces of other nerve cells. Neurofibrillary tangles (NFTs), found inside neurons, are abnormal collections of a protein called tau. Normal tau is required for healthy neurons. However, in AD, tau clumps together. As a result, neurons fail to function normally and eventually die. Loss of connections between neurons responsible for memory and learning. Neurons can't survive when they lose their connections to other neurons. As neurons die throughout the brain, the affected regions begin to atrophy, or shrink. By the final stage of AD, damage is widespread and brain tissue has shrunk significantly. Although we still don’t know what starts the Alzheimer’s disease process, we do know damage to the brain begins as many as 10 to 20 years before any problems are evident. Tangles begin to develop deep in the brain, in an area called the entorhinal cortex, and plaques form in other areas. As more and more plaques and tangles form in particular brain areas, healthy neurons begin to work less efficiently. Then, they lose their ability to function and communicate with each other, and eventually they die. This damaging process spreads to a nearby structure, called the hippocampus, which is essential in forming memories. As the death of neurons increases, affected brain regions begin to shrink. By the final stage of Alzheimer’s, damage is widespread and brain tissue has shrunk significantly. Memory problems are one of the first signs of Alzheimer’s disease. Some people with memory problems have a condition called amnestic mild cognitive impairment (MCI). People with this condition have more memory problems than normal for people their age, but their symptoms are not as severe as those with Alzheimer’s. More people with MCI, compared with those without MCI, go on to develop Alzheimer’s. Other changes may also signal the very early stages of Alzheimer’s disease. For example, brain imaging and biomarker studies of people with MCI and those with a family history of Alzheimer’s are beginning to detect early changes in the brain like those seen in Alzheimer’s. These findings will need to be confirmed by other studies but appear promising. Other recent research has found links between some movement difficulties and MCI. Researchers also have seen links between some problems with the sense of smell and cognitive problems. Such findings offer hope that some day we may have tools that could help detect Alzheimer’s early, track the course of the disease, and monitor response to treatments. As Alzheimer’s disease progresses, memory loss continues and changes in other cognitive abilities appear. Problems can include getting lost, trouble handling money and paying bills, repeating questions, taking longer to complete normal daily tasks, poor judgment, and small mood and personality changes. People often are diagnosed in this stage. In this stage, damage occurs in areas of the brain that control language, reasoning, sensory processing, and conscious thought. Memory loss and confusion increase, and people begin to have problems recognizing family and friends. They may be unable to learn new things, carry out tasks that involve multiple steps (such as getting dressed), or cope with new situations. They may have hallucinations, delusions, and paranoia, and may behave impulsively. By the final stage, plaques and tangles have spread throughout the brain and brain tissue has shrunk significantly. People with severe Alzheimer’s cannot communicate and are completely dependent on others for their care. Near the end, the person may be in bed most or all of the time as the body shuts down. Scientists don’t yet fully understand what causes Alzheimer’s disease, but it is clear that it develops because of a complex series of events that take place in the brain over a long period of time. It is likely that the causes include genetic, environmental, and lifestyle factors. Because people differ in their genetic make-up and lifestyle, the importance of these factors for preventing or delaying Alzheimer’s differs from person to person. Scientists are conducting studies to learn more about plaques, tangles, and other features of Alzheimer’s disease. They can now visualize plaques by imaging the brains of living individuals. They are also exploring the very earliest steps in the disease process. 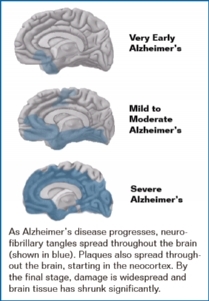 Findings from these studies will help them understand the causes of Alzheimer’s. One of the great mysteries of Alzheimer’s disease is why it largely strikes older adults. Research on how the brain changes normally with age is shedding light on this question. For example, scientists are learning how age-related changes in the brain may harm neurons and contribute to Alzheimer’s damage. These age-related changes include atrophy (shrinking) of certain parts of the brain, inflammation, and the production of unstable molecules called free radicals. In very few families, people develop Alzheimer’s disease in their 30s, 40s, and 50s. Many of these people have a mutation, or permanent change, in one of three genes that they inherited from a parent. We know that these gene mutations cause Alzheimer’s in these “early-onset” familial cases. Not all early-onset cases are caused by such mutations. Most people with Alzheimer’s disease have “late-onset” Alzheimer’s, which usually develops after age 60. Many studies have linked a gene called APOE to late-onset Alzheimer’s. This gene has several forms. One of them, APOE ε4, increases a person’s risk of getting the disease. About 40% of all people who develop late-onset Alzheimer’s carry this gene. However, carrying the APOE ε4 form of the gene does not necessarily mean that a person will develop Alzheimer’s disease, and people carrying no APOE ε4 forms can also develop the disease. Most experts believe that additional genes may influence the development of late-onset Alzheimer’s in some way. Scientists around the world are searching for these genes. Researchers have identified variants of the SORL1, CLU, PICALM, and CR1 genes that may play a role in risk of late-onset Alzheimer’s. A nutritious diet, physical activity, social engagement, and mentally stimulating pursuits can all help people stay healthy. New research suggests the possibility that these factors also might help to reduce the risk of cognitive decline and Alzheimer’s disease. Scientists are investigating associations between cognitive decline and vascular and metabolic conditions such as heart disease, stroke, high blood pressure, diabetes, and obesity. Understanding these relationships and testing them in clinical trials will help us understand whether reducing risk factors for these diseases may help with Alzheimer’s as well. These tests may be repeated to give doctors information about how the person’s memory is changing over time. Early diagnosis is beneficial for several reasons. Having an early diagnosis and starting treatment in the early stages of the disease can help preserve function for months to years, even though the underlying disease process cannot be changed. Having an early diagnosis also helps families plan for the future, make living arrangements, take care of financial and legal matters, and develop support networks. In addition, an early diagnosis can provide greater opportunities for people to get involved in clinical trials. In a clinical trial, scientists test drugs or treatments to see which are most effective and for whom they work best. Alzheimer’s disease is a complex disease, and no single “magic bullet” is likely to prevent or cure it. That’s why current treatments focus on several different aspects, including helping people maintain mental function; managing behavioral symptoms; and slowing, delaying, or preventing the disease. Currently there are no medicines that can slow the progression of AD. However, four FDA-approved medications are used to treat AD symptoms. These drugs help individuals carry out the activities of daily living by maintaining thinking, memory, or speaking skills. They can also help with some of the behavioral and personality changes associated with AD. However, they will not stop or reverse AD and appear to help individuals for only a few months to a few years. Donepezil (Aricept), rivastigmine (Exelon), and galantamine (Reminyl) are prescribed to treat mild to moderate AD symptoms. Donepezil was recently approved to treat severe AD as well. The newest AD medication is memantine (Namenda), which is prescribed to treat moderate to severe AD symptoms. Get Severe Alzheimer's Disease treatment information and potential cures about Alzheimer's condition by going to stages of Alzheimer's disease. Alzheimer’s disease research has developed to a point where scientists can look beyond treating symptoms to think about addressing the underlying disease process. In ongoing clinical trials, scientists are looking at many possible interventions, such as cardiovascular and diabetes treatments, antioxidants, immunization therapy, cognitive training, and physical activity. Caring for a person with Alzheimer’s disease can have high physical, emotional, and financial costs. The demands of day-to-day care, changing family roles, and difficult decisions about placement in a care facility can be hard to handle. Researchers are learning a lot about Alzheimer’s care giving, and studies are helping experts develop new ways to support caregivers. Click-here for Health Tip-of-the-Day. Becoming well-informed about the disease is one important long-term strategy. Programs that teach families about the various stages of Alzheimer’s and about flexible and practical strategies for dealing with difficult care giving situations provide vital help to those who care for people with Alzheimer’s. Developing good coping skills and a strong support network of family and friends also are important ways that caregivers can help themselves handle the stresses of caring for a loved one with Alzheimer’s disease. For example, staying physically active provides physical and emotional benefits. Some Alzheimer’s caregivers have found that participating in a support group is a critical lifeline. These support groups allow caregivers to find respite, express concerns, share experiences, get tips, and receive emotional comfort. The Alzheimer’s Association, Alzheimer’s Disease Centers, and many other organizations sponsor in-person and online support groups across the country. There are a growing number of groups for people in the early stage of Alzheimer’s and their families. Support networks can be especially valuable when caregivers face the difficult decision of whether and when to place a loved one in a nursing home or assisted living facility. Thirty years ago, we knew very little about Alzheimer’s disease. Since then, scientists have made many important advances. Research supported by NIA and other health organizations has expanded knowledge of brain function in healthy older people, identified ways we might lessen normal age-related declines in mental function, and deepened our understanding of the disease. Many scientists and physicians are now working together to untangle the genetic, biological, and environmental factors that, over many years, ultimately result in Alzheimer’s. This effort is bringing us closer to the day when we will be able to manage successfully or even prevent this devastating disease.